This month’s post is by Dr David Walsh, Lecturer in Classical & Archaeological Studies at the University of Kent. In the mid-third century AD, a temple to the god Mithras was constructed in London close to the Walbrook Stream, in an area now overlooked by Cannon Street Station and St Paul’s Cathedral. The construction of the temple was funded by a certain Ulpius Silvanus, a former Roman soldier, and remained in use for around 60 years into the early fourth century. When the building ceased to be used as a mithraeum, the head and hand from a large statue of Mithras, along with parts from other cult statues, were placed in a pit inside the temple near to the entrance. The temple was then reused by another cult, perhaps that of Bacchus, until the late fourth century. 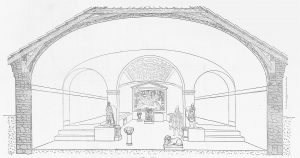 The story of the mithraeum didn’t end there, however, for during the restoration of the area following World War II the ruins of the temple emerged and became a media sensation. Such a discovery, with the foundations of the temple and many of the finds unearthed therein remarkably well preserved, was unprecedented at the time and huge numbers flocked to the site to catch a glimpse of London’s Roman past (including one pregnant lady who was so taken by the site she actually named her daughter Mithras). Under the direction of W. F. Grimes, the main cella (inner chamber) of the temple was excavated and the finds sent to the Museum of London, where many remain on display today. The remnants of the temple were rebuilt on a roundabout next to where it had sat for nearly 1500 years and over time its importance faded. Indeed, many years ago when I went to have a look at the temple only to find it no longer there, I was informed by a local shop owner that it was never that interesting anyway – just ‘a pile of rocks’. Somewhat ironically, the removal of this ‘pile of rocks’ was due to forthcoming redevelopment of the area as it was to serve as the site of the new Bloomberg European HQ, circumstances which in turn would lead to the temple being propelled back into the limelight. Fortunately, Bloomberg took a keen interest in the history and archaeology of the site, supporting new excavations by MOLAS, who recovered a wealth of fantastic finds (including a rare cache of Roman writing tablets) as well as previously untouched sections of the temple’s anterooms, and decided to incorporate a permanent exhibition space into their new HQ in which the mithraeum could be viewed in its original context. After many years of preparation, in November 2017 the London Mithraeum was opened to public, providing an interactive experience designed to demonstrate what it would have been like if one had entered the temple in the late third century. But what was it like in a mithraeum? 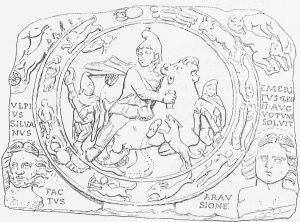 Who was Mithras? Where did his cult come from? Who joined his cult and how did one gain access to this secretive group? Apart from a fragment of papyrus from Egypt which appears to contain lines from a Mithraic initiation script, there are no known Mithraic texts that survive that inform as to what Mithraic initiates believed or if they had any rules to adhere to. A number of ancient authors did write about the cult, but many of these were Christians who were often more interested in insulting the cult than providing accurate information about it. However, we have been able to construct a relatively decent picture of what the cult involved from the archaeology, as we have a wealth of Mithraic building remains, inscriptions, offerings and iconography. 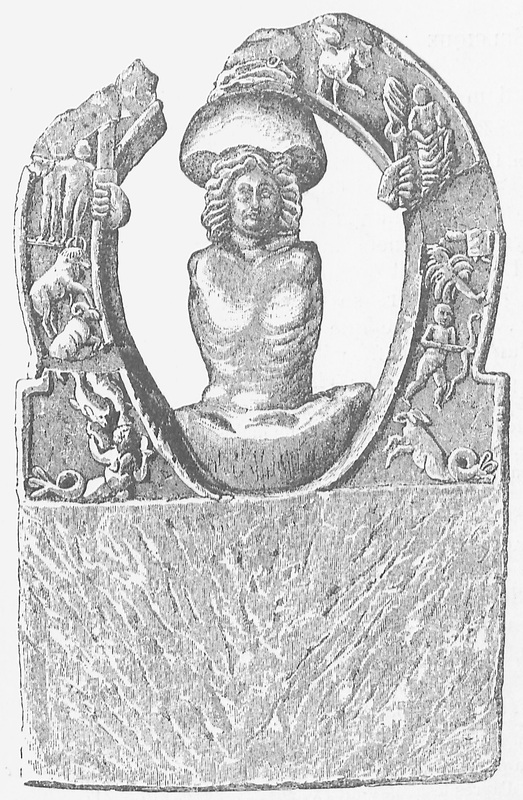 Figure 2: Statuette of Mithras emering from the rock found at the Housesteads Mithraeum on Hadrian’s Wall (Cumont 1899, Fig. 315). Let us begin with Mithras himself. He is always shown dressed in a tunic, often with a cape billowing behind him, and wearing a conical hat with the tip pulled forward (known as a ‘Phrygian cap’). 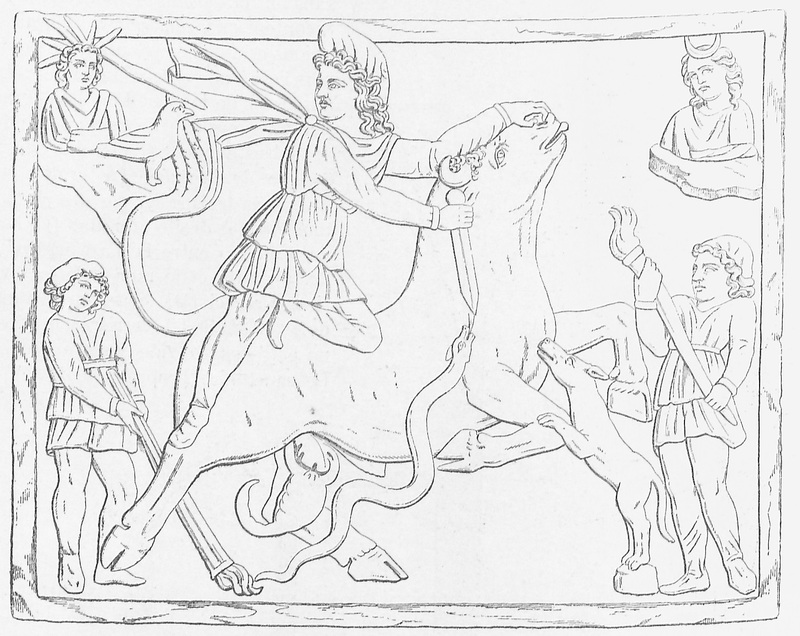 From the various images that have been uncovered a general narrative of Mithras’ ‘life’ can be composed. He wasn’t ‘born’ to parents, but rather emerged from a rock. Subsequently, he looks to have shot an arrow into a rock, from which water gushed forth (he is sometimes referred to in inscriptions as ‘the eternal spring’), but his main destiny, which formed the central image of the cult that was present in every mithraeum, was to drag a bull into a cave and kill it by slitting its throat. Figure 3: The Bull-Slaying Scene (Cumont 1889, Fig. 267). Given we have no texts to provide an explanation, what the bull and the act of sacrifice were designed to represent is open to interpretation. That a dog and snake are depicted feeding from the bull’s blood as a scorpion grasps its testes, while ears of corn or grapevines are sometimes shown appearing from the bull’s tail and wound, suggests this symbolises the creation (or recreation) of the universe, with the bull’s blood and seed seen as life-giving. Another interpretation is the victory of light over dark, with Mithras the representative of the Sun and the bull that of the Moon. Sol (the personification of the Sun) is frequently shown in the top left of the bull-slaying scene with Mithras’ head turned to face him rather than the bull (sometimes a raven appears between Sol and Mithras, perhaps acting as a messenger), while above the bull is Luna (the Moon). Additionally, on the Mithras/Sol side of the relief is often a figure dressed similarly to Mithras and holding a raised torch, with an identical figure on the opposite side holding a lowered torch; these are known as Cautes and Cautopates respectively and they appear to represent the rising and setting suns (as well as perhaps the summer and winter equinoxes). Finally, a third option is that all these characters are representative of an astrological arrangement, e.g. the bull = Taurus, the dog = Canis major and minor, the scorpion = Scorpio, the torch-bearers = Gemini etc. Once this act of sacrifice had been conducted Mithras is sometimes shown celebrating with Sol, with the two either shaking hands or enjoying a feast. 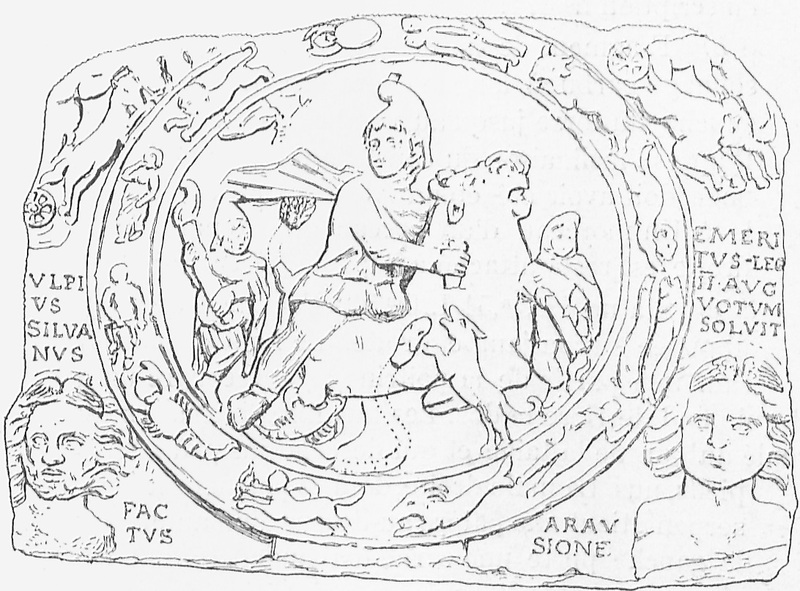 After this, Mithras looks to have ridden a chariot up to the heavens, concluding his ‘life-story’. What about the people who worshipped Mithras? To begin with it’s worth pointing out that although commonly used the terms ‘Mithraist’ and ‘Mithraism’ are actually misnomers and best avoided. This is because they imply a religious movement akin to various other ‘-isms’, such as Judaism, Hinduism and Sikhism, which have particular doctrines and teachings to follow. Given we don’t know if there were any Mithraic doctrines or teachings, it’s safer just to speak of Mithraic ‘worshippers’ or ‘initiates’ and the ‘cult of Mithras’. It’s also worth bearing in mind we never hear of ‘Solism’, ‘Jupiterism’ or, thankfully, ‘Isisism’. Adherents of the cult were largely drawn from the military and customs officials, although as time progressed civilians also began to join. Why such a strong following amongst the military and customs-officials? It would seem that the attributes of the cult lent themselves strongly to the social context in which these men operated. For one, the cult was male-only, while in order to undergo a Mithraic initiation (see below), you probably required a pre-existing member to sponsor you and then you had to place significant trust in them and the rest of the community in undergoing this intense test of loyalty. There was also a strict Mithraic hierarchy consisting of 12 grades, with the pater (father) the highest and the corax (raven) the lowest. As time progressed initiates would progress up through the grades but only a small number obtained the highest positions, with the most commonly referenced grade in inscriptions that of leo, the middle grade. 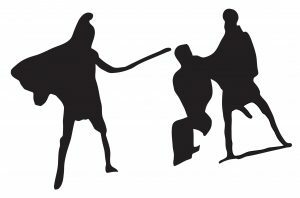 This was due to the Mithraic hierarchy intently maintaining the status quo: never do we find a slave ranked higher than a freedman, or an ordinary soldier over a centurion. Much like the army and custom-officials, the cult sought to cement power structures, not overturn them. 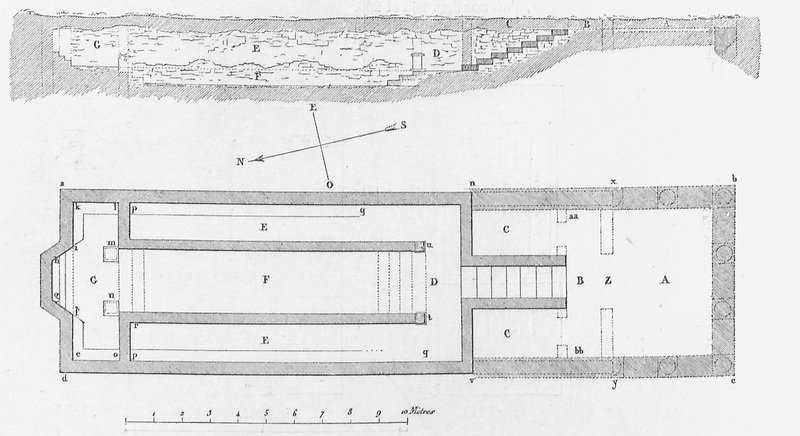 Figure 4: Plan and Section of a Mithraeum at Heddernheim, Germany (Cumont 1899, Fig. 430). The vast distances these men could move when they were re-posted also allowed the cult to spread over a wide area; by the second century, mithraea were to be found stretching from Hadrian’s Wall to Syria. 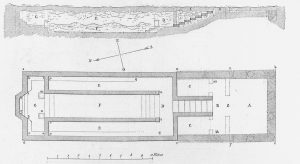 Mithraea are a godsend for archaeologists in that they are relatively easy to recognise given the cella of these buildings nearly all share the same ground plan, which consisted of a central aisle flanked by benches. Often, the aisle would terminate at an apse or raised platform where a depiction of the bull-slaying would be found. These cella rarely had any access to natural light, but instead were illuminated with lamps and candles. There is evidence some had dome-like ceilings fashioned from wattle-and-daub and these were occasionally decorated with glass or other shiny objects to make it appear as though one were looking up at the night sky. The intention behind all these aspects of the cella appears to have been to recreate the cave in which the bull-slaying took place, as well as providing an astrological arrangement whereby standing at its centre would be akin to standing in the middle of the universe. Attached to the cella would usually be at least one anteroom, which provided a space for the preparation of ritual meals, storage space for objects used in rituals, and maybe an area to educate prospective initiates. With no windows and access strictly controlled, what went on inside mithraea remained very much a mystery to those outside. Indeed, of all the so-called ‘mystery cults’ in the Roman world, only that of Mithras could truly claim such a label, as no Mithraic rituals took place outside of a mithraeum. 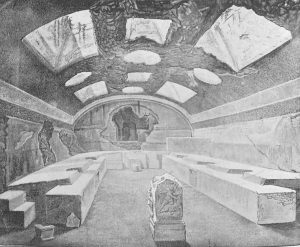 Figure 5: Reconstruction of Mithraeum ‘III’ at Carnuntum, Austria (Cumont 1899, Fig. 430). Fortunately, through archaeological excavation (and with some help from speculative accounts produced by contemporary outsiders), we do have some idea as to what Mithraic rituals consisted of. The most important were the initiations. For this, the new worshipper was stripped, blind-folded and his hands bound. He then knelt in front of the father who would point either a torch, sword, or bow and arrow at the initiate’s head (or at least the blindfolded initiate thought this was happening). When the initiate was thoroughly terrified the blindfold was pulled away and he could gaze upon the image of Mithras suddenly bathed in light in the midst of the dark cella (well, illuminated by a lamp or candle). The experience would perhaps culminate (or begin) with the initiate pretending to die and examples of swords bent so they could be placed around a torso have been found in mithraea. Another major ritual was feasting, which was probably intended to replicate that held by Sol and Mithras in the wake of the latter slaying the bull. There is no evidence to suggest that these feasts involved actually involved sacrificing and eating a bull, rather the main food of choice was chicken and sometimes piglet. Occasionally, such animals also appear in small, individual sacrificial deposits under mithraea, perhaps interned in order to sanctify the temple when it was constructed. Additionally, there was some use of water and perhaps honey in a cleansing ritual (with honey representing fire). Mithraea were frequently, constructed near water features such as springs and streams and this looks to have stemmed from Mithras’ status as the ‘internal spring’ mentioned above. 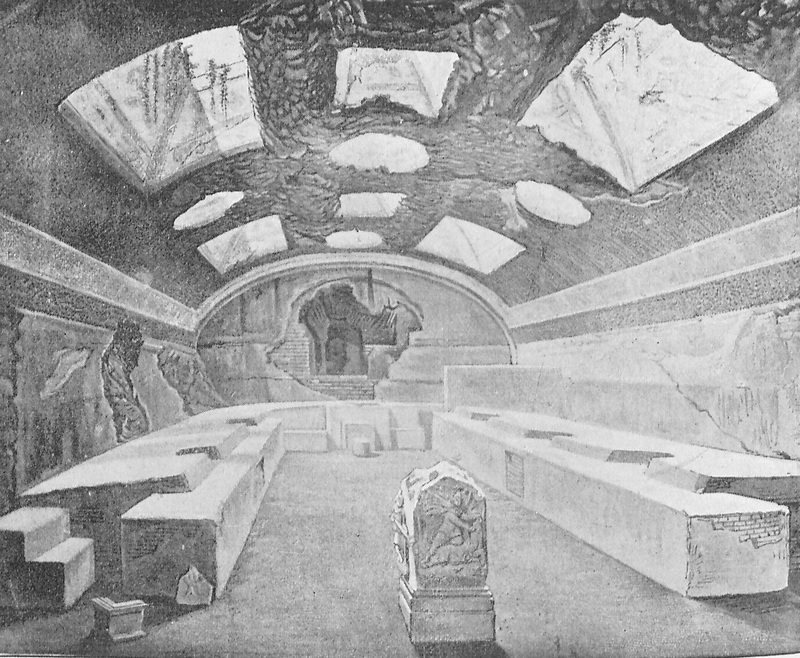 Figure 6: the Mithraeum under San Clemente, Rome (Cumont 1899, Fig. 30). Figure 7: Fresco from the Capua Mithraeum depicting a Mithraic initiation with the Father on the left, the initiate in the centre and his sponsor (?) on the right (Vermasaren 1956, no. 188). See original here. BECK, R. 2006. The Religion of the Mithras Cult in the Roman Empire. Oxford: Oxford University Press. CUMONT, F. 1896-1899. Textes et monuments figurés relatifs aux mystères de Mithra (2 Vols.). Bruxelles: H. Lamertin. CLAUSS, M. 2000. 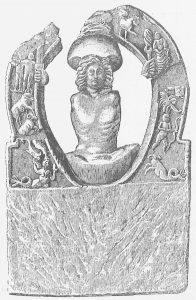 The Roman Cult of Mithras: The God and his Mysteries. Edinburgh: Edinburgh University Press. GORDON, R. Image and Value in the Graeco-Roman World: Studies in Mithraism and Religious Art. Aldershot: Variorum. ———. 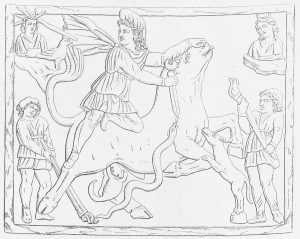 Cultores Mithrae: Die Anhängerschaft des Mithras-Kultes. Stuttgart: Franz Steiner. MARTENS, M. and DE BOE, G. 2004. Roman Mithraism: The Evidence of the Small Finds. Brussels: Instituut voor het Archeologisch Patrimonium. SHEPHERD, J. 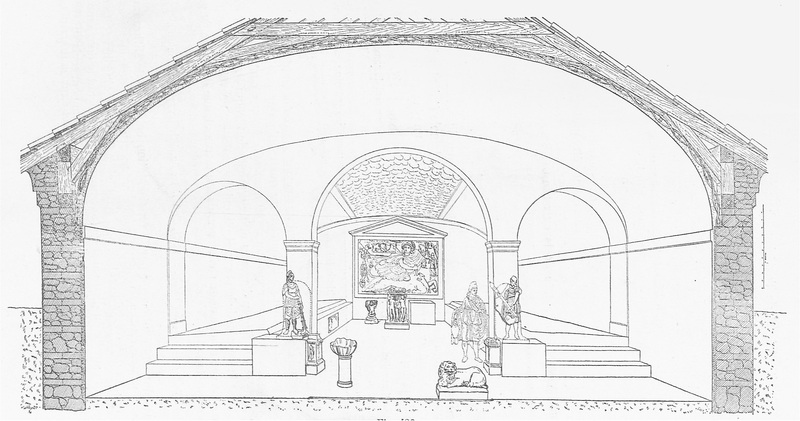 1998: The Temple of Mithras, London: Excavations by W. F. Grimes and A. Williams at the Walbrook. London: English Heritage. VERMASEREN, M. J. 1956-1960. Corpus inscriptionum et monumentorum religionis Mithriacae (2 Vols.). Hagae Comitis: M. Nijhoff. What is Humanities Research at Kent?